Super Mario The Race Is On She..
Sheet set consists of a white ground fitted sheet and blue ground flat sheet featuring iconic Super Mario images * Includes 1 flat sheet 66 by 96-Inch, 1 fitted sheet 39 by 75 by 10-Inch and 1 pillow case 20 by 30-Inch * 100-Pecent polyester microfiber * Machine wash, tumble dry, low iron when needed * Imported item The Race is On zoom around the race track with Super Mario and his fellow competitors as the race to be #1 at the finish line. Fun 100-Percent polyester microfiber comforter and sheet set features the ensemble cast of the Super Mario games. Sheet set includes white ground fitted sheet and blue ground flat sheet adorned with iconic Super Mario images. Reversible pillowcase features Mario and reverses to Luigi. The product description states,"The Race is On zoom around the race track with Super Mario and his fellow competitors as the race to be #1 at the finish line. 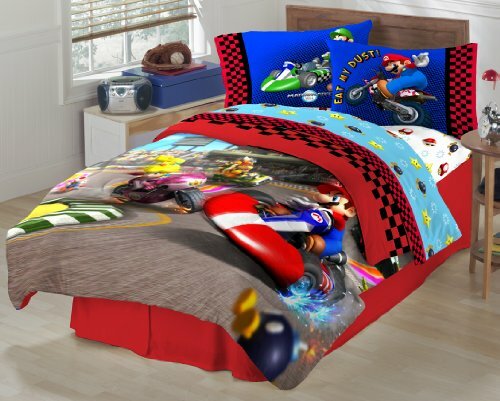 Fun 100-Percent polyester microfiber comforter and sheet set features the ensemble cast of the Super Mario games. "I should've read this description more thoroughly, because I assumed that the comforter in the picture, and the comforter mentioned in the description was included. Much to my surprise, it was not.Turns out, I paid $40 for a kids sheet set..
fresnoskin1 - See all m.. These sheets are not what we expected. The icons on the sheets are only yellow stars and cartoon bombs from the game. Where's mario or luigi? I paid $44 to have mario and lugio on the sheet set...but mario and luigi are only on the one pillow case, not on the sheets. The descripton of the item is misleading. What a rip off. rstorti - See all my re.. The sheets are very thin on this and i do not expect them to hold up for long term wear. But they are adorable. Very cheap to buy at Walmart and no shipping. I say buy it there. My son loves these and we have a fat head over his bead of mario and the bombs and stars so it fits in perfectly. Walmart also has curtains that match. J. Bonavita "Mom on 2 wh..